Virginia Tech took care of business on the road, downing Georgia Tech 76-56 in Atlanta in a game that was not nearly as close as the final score indicated. The Hokies improved to 19-8 overall and 8-6 in ACC play with the victory. Meanwhile, the Yellow Jackets dropped to 11-16 and 4-10. The victory means the Hokies are now 5-3 in ACC road games, and it guarantees that the team will finish with a winning road record in the ACC for the first time in school history. Junior point guard Justin Robinson paced the team with 18 points, and he also had four assists. He passed Dell Curry on Tech’s all-time assists list. He now has 408 assists in his career, which is fifth all-time in Tech history. Devin Wilson also made it to 400 assists in this game, and he is just the seventh Virginia Tech player to have 400+ assists in his career. He currently has 403 career assists. The Hokies only scored eight points over the final 10 minutes of the game, which made this performance seem a little less dominant than it actually was. However, after Georgia Tech jumped out to a 14-8 lead, it was all Virginia Tech. The Hokies then proceeded to outscore the Yellow Jackets 56-18 between the 16:12 mark of the first half and the 12:42 mark of the second half. At that point it was 64-32 Virginia Tech, and they eventually led by as many as 35. Despite their offensive slump down the stretch with mostly backups in the game, the Hokies still put up very good offensive numbers. They were 28-of-53 (52.8%) from the field and 8-of-16 (50%) from three-point range. As a team, they dished out 21 assists on 28 made baskets. At halftime, they had 14 assists to just three turnovers, though things got sloppy down the stretch with a big lead and many reserves playing together. Nickeil Alexander-Walker had 14 points for the Hokies, while Justin Bibbs added 10 points and four assists. Kerry Blackshear had seven points, eight rebounds, four steals and two assists. 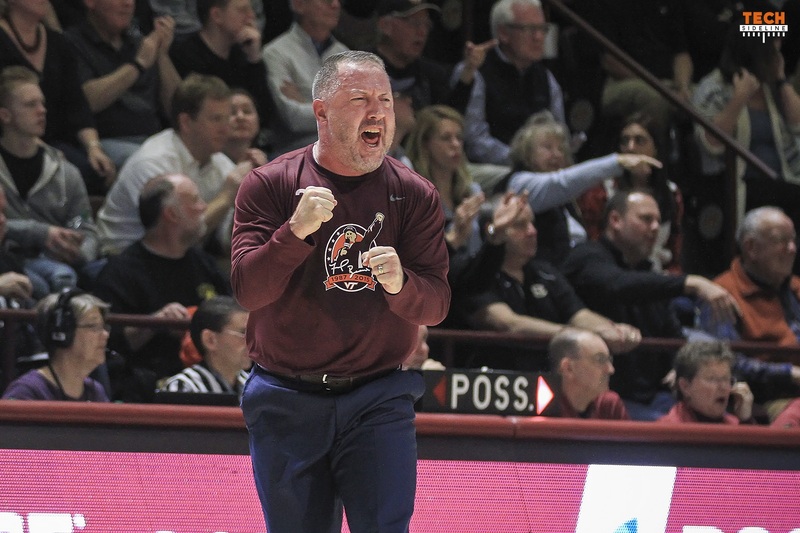 Buzz Williams was able to rest many of his starters for the latter stages of the game, which should bode well for the final four games of the regular season when the Hokies play three straight home games against No. 11 Clemson, Louisville, and No. 12 Duke, and then follow that up with a road trip to Miami. Chris Clarke, Kerry Blackshear and Justin Bibbs played 24 minutes, which was the highest number on the team. Justin Robinson had 23 minutes. Young backups such as PJ Horne, Tyrie Jackson and Wabissa Bede were able to play 15+ minutes. Virginia Tech returns to action on Wednesday night when they host No. 11 Clemson. Tipoff is scheduled for 7pm, and the game will be televised by RSN. Check your local listings. The result of this game was the best possible scenario heading in to a critical stretch. Except for Med Hill. Anyone seen him lately? Over his last 5 games, he has scored 0/4/0/2/3 pts. He scored 15+ pts 12 times this season. What in the world has happened? It’s got to be mental, so I hope Buzz can motivate him to play to his potential. If Tech is going to make the tournament, we need all hands on deck. I was wondering the same thing and thought for sure GT game would have been great opportunity for him to get his shot back! Agree that if he does, his double digit points potential could be difference at tourney time! Got to see this one in person. There was some great passing throughout the game. And it was great seeing DW sneaking to the basket and getting some easy ones. The kept taking their eyes off him. Great offensive game plan against GT. Need at least one and maybe two to make the NCAA. We pushed GT to the end of the shot clock several times. Let’s hope we can fix our woes at home. I love it the 2nd half is boring – in a good way.